When we make the decision to start making changes in our life, especially when we get involved in restrictive dieting, weight loss feels like anything but simple. Our mind is going a million miles an hour over every decision we make around food and exercise and we fail at really checking in and looking at how we’re feeling and what progress we’re actually making. As a CEO, I know that you are an exceptional problem-solver, but when it comes to taking care of our bodies, it’s easy for our own thoughts to get in our way and even fool us into thinking we’re doing the right things. Well, with my simplified weight loss strategy, coupled with some of the eating and exercise hacks that I’ve shared on the podcast, getting in your own head will stand in your way no more. Join me on the podcast this week as I share a weight loss strategy and framework, which I break down clearly into three main aspects, that will get you on the right track and help you stay there until you see the results that you’re looking for. If you need a little help getting to grips with some of the concepts in this episode, download my guide for this episode! And if you have a question about these topics, or anything related to health and wellness, please, send me an email and I will feature it in a future episode! Why I believe taking care of your health was always meant to be intuitive. How to follow my intuitive eating tools for simplicity and empowerment. Why we have to set achievable movement goals for sustained weight loss. How to identify what you need to change around your eating to see results. Why no aspect of losing weight requires you to be absolutely 100% consistent all the time. What you can do to overcome the mind drama that appears at the start of a healthy transition. 3 things to focus on to achieve your weight loss goal. Alright, so, in today’s podcast, I am just so glad to be with you today. What I am going to cover today is helping you to simplify in your mind how to work on losing weight. Now, this is with an assumption that you’ve been a listener for a little bit and know some of my tools. But if you’re new, it also is an amazing overview, giving you an idea of how to really let your mind simplify this process. Our brain loves to complicate, get very busy, and really gets in the way of results so often, especially in the way we take care of our body. I think taking care of our physical needs was always meant to be intuitive. It was always meant to be, the way that our body was designed and morphed for survival, we talk about cavemen days. If we were hungry, which probably those cavemen were fasting for days, not having enough food or having grains until meat was available. And so if our body was designed not to have food available all the time, which is our world, and to be so tempted and to have this culture of sweets and processed foods, those things, I think, have gotten us really off our game of a more natural way to approach food. And so a lot of the work that I do as a coach, as a weight loss coach and a mindset coach around wellness is to simplify. And what I want to do today is to remind my clients, to help them to really know what will work for them. So, the idea that I have gotten to, being a coach for four years now in this space and doing this work myself, I have twists and turns where I need to apply what I’m learning. I am finding some deeper success, not only with my clients, but with myself by adding some tweaks to this. So, this is the bottom line, that you can simplify this process by focusing on three major things; one intuitive eating tool, one mindful eating tool, and I’ll share those with you in a minute, one very realistic movement goal, and one bold move. And then, I’m going to share my process of really how do you evaluate your results. How are you evaluating what is right and what isn’t? So, I’m going to dig in and talk about the one mindful tool and how to choose that, and then I’m going to talk about simplifying that movement goal, getting the mind drama out of the way that it’s a big project, and really talk about bold moves. There are other podcasts that relate to this and I will refer to them, but just know that that resource is there. I’m going to leave a guide that you can download if you want to work on this. I want to keep this very, very simple. Okay, so, each week when I work with a client after they’ve learned the tools, both the hunger scale and fuel testing – fuel testing is episode three and four and applying the hunger scale is episode two and six. 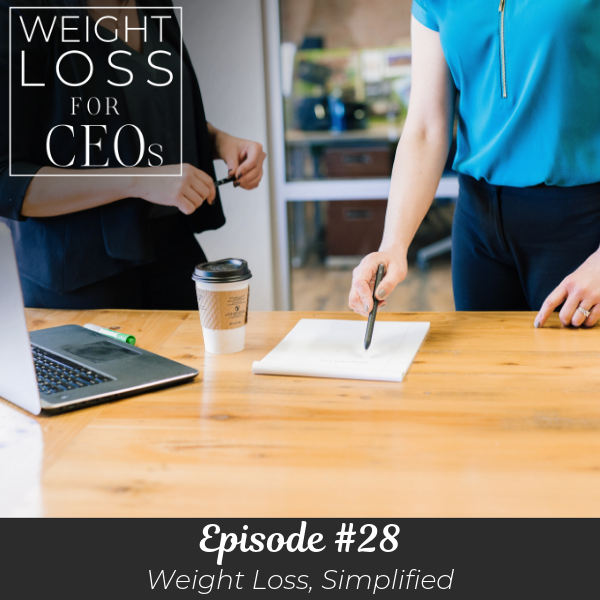 And this is the beginning of my podcast, Weight Loss for CEOs that starts with 001. So all through that, if you binge listen or want to refer to any, these all will support what I’m sharing today. By focusing on just one mindful eating tool and choosing one that will really amp up your next week in terms of focusing on food is really, really powerful. It simplifies – you may know the entire way to choose lean fuel or to follow the hunger scale from minus-two to plus-two, but by focusing on one portion of one of the tools, you will literally put your brain to work that bypasses complex, makes it very simple and can empower you for the week. So, let me give you an example. I teach the hunger scale, which really, in a basic form is only eating when you’re hungry, when you can answer the question, am I hungry, and am I full. If you find that you wait way too long to eat, you want to focus on the negative side of the hunger scale. You want to always honor, am I hungry, and just practice that. That’s it. If you find that you overeat a lot and it has nothing to do with leaving you really hungry or it’s the side of the scale that you’d like to start on, then all you should focus on while you’re eating and eating slowly is, am I full? So this is what I mean by focusing on one very small facet. The hunger scale is eating to a light hunger at minus-two, not waiting until headaches or discomfort in your stomach, but light hunger that you feel fluttery in your stomach and a little distracted, that’s minus-two. And then eating until you’re plus-two, which is lightly full. And plus-two is when, if you’re really paying attention, your body stops asking you to eat. You feel like a letdown, a sigh. I have gotten to the point where I do this very, very naturally, but if I put on a little weight or am really distracted, in a distracted environment, I lean in and really listen. So, what is it for you? And I’m going to offer another intuitive eating tool and you can still make your decision from that, but would it be powerful for you, for just one week, to focus on the hunger scale on the negative side, always practicing honoring hunger so that you don’t get too hungry, or just simply honoring the plus-two side. Now, the other facet of intuitive eating is the what to eat. And fuel testing is done by answering three simple questions. So, if you really are looking at your life and you are not overeating very much or you have practiced the hunger scale with me and you are really in a good rhythm and you don’t overeat very often or don’t get that out of control feeling that many of us have had around food, I get that. Usually, when I’ve eaten the wrong foods in the morning, I have different cravings and that happens for me. If you though are really in a cadence and a rhythm where you honor your hunger scale, my suggestion, if you focus on one tool, would be focusing on, is this fuel for me? And when you laser focus on how you feel when you eat any particular food, you can get so much information. When you test fuel, it’s simple questions. It is asking, does this food give me good energy? That’s it. Does this food satisfy me for more than two or three hours? And the most difficult question on some foods like potato chips, can I stop at full, at plus-two? If a food meets all those requirements, it’s a fuel food. So, I suggest, when my clients are new to me, I teach them actually the hunger scale first. So if you’re very new to this work, I would just start asking, am I hungry, am I full? If you’ve done the scale a little deeper, I would definitely start focusing on one side of the scale that you feel a little out of control with and practice. Now, if you’ve got those down, my one tool would be, can I amp up the percentage of fuel I eat in my week? And it’s not being perfect. I never ask a client to eat 100% fuel. And even the clients that are actively losing weight, if I ask them the percentage of fuel, even a subjective number, if I asked them how much fuel they were eating in their diet, those that are losing weight are anywhere from 75% to 85%. When I was taught this, we were taught 90%. And there is that sweet spot that we don’t have to be perfect, but we eat a level of fuel that can really work for us. If you’d like to change that or start feeling better around food then I would do fuel testing. Really watch how your body reacts after you eat food. If you have a really strong negative reaction, that is not fuel for you. If you have a really good positive reaction, I would note that that is on your fuel list. Alright, so what does following these tools do? When you follow both of these tools in a rhythm of knowing how to do them and you’ve practiced them for three to four weeks, you are literally starting to ask better questions and eating mindfully. You’re eating not because of the clock. You’re not eating because someone serves you a whole plate of spaghetti and you just eat what anybody puts in front of you. This is literally being deliberate about what you choose, eating slowly, and just seeing how your body likes it or not. Each person is so uniquely wired that it is really important to pay attention to the fuel and use information in the market about what’s good for you. Definitely look at nutrition labels. But really dive into what feels good in your body. Intuitive eating has so many benefits. And for the sake of this podcast, I am not going to deep dive into it, but watch for a testimonial podcast that’s coming up. I’m really going to dig deep and share with you the unexpected and amazing bonuses of eating in this way. One is, and it’s a great analogy when, when we get eating intuitive and eating mindfully, we can much more naturally be mindful in our day. Drawing yourself back into your body, being in your body, and really deciding what should I eat and how much should I eat. Alright, so that’s the food tools. So, when you’re going through your next week or so, what is one tool? Are you going to test your fuel? Are you going to focus on the negative side of the hunger scale or the positive? Now, choose it, now, and just write that down or just note what you’d like to practice. The next phase, and this is just a weekly practice of choosing one area to focus on for your wellness, and the next is choosing a movement goal. Now, I’m not going to go deep into this. On episode five, I explain how you create like a minimum movement goal and getting very simple and starting very small pieces helps your brain to not have resistance. This is really creating one-degree shifts, doing them very consistently, and then tweaking. And it’s getting out of your own way and doing this big, like, seven workouts a week challenge, it is doing something that’s so attainable that you can really master it. So, choose a movement goal. Look at your calendar, what is realistic, at least, usually, three movement opportunities a week, three exercise dates with yourself. Choose those and put them on your calendar. So, again, choose one mindful eating tool, one facet. It might be just asking the question – I’m going back to this in review, but it might be just asking what foods feel really good in my body and what don’t? It could be that simple. Just focus on one facet. Then choose a minimum, around two to three times, when can you plug a workout in, and put it in your calendar and put what it is. Even sign up for those events. Now, the third thing I’m starting to ask my clients and has totally changed things for me, and takes work – this is where the mindset work comes in – it is choosing a bold move. Sometimes, not having a certain food that we really love or a certain food or alcohol that we know really trips us up. If I ask my clients – this is how I came up with this – if I ask my clients what is just one thing that if you did it you know it would make amazing impact in losing weight or feeling really good? Because I work with people that re wellness-focused and we’re doing a lot of mindset work and executive coaching, but I also work with people that are really focused on losing weight. And they always know the answer. And I know you’ve shared with me my journey and I won’t belabor it too much, but I really am at the other end of this. My bold move was really looking at how I was drinking wine. And I do drink wine, but the most I ever drink in a week that serves me the best, and I’m not perfect at this, is once a week. And I sometimes even skip that, but there is usually one night or one meal that I know I really would just like to enjoy a glass of wine. And what I’d noticed beforehand was, a few things, I noticed I was having really negative body reactions, and this is why I chose this bold move. And this is what I want you to be looking at; if there is something that you’re seeing in the way that your body is reacting, the way that you typically will overeat if you eat this food? If I eat a lot of bread in the morning, I will overeat carbs all day. Like, it’s something like that. And your bold move might be no bread, or bread once a week, or only whole grains, and just testing that and seeing how that bold move helps you. And so I decided to not drink wine for a week and see what happened. And the bonuses and the outcomes were so great, I was giddy with excitement. I’m not kidding. I had been kind of slightly bloated every time. I just felt puffy and kind of not good in my kind of torso area, and noticed it in my clothes and it was not really a big deal. I fit in things, but I just noticed it when I drank wine, especially as more of a habit, like a glass, not very much, but maybe a glass every night, or a sip of it as a dessert. I was trying to make it less and it just didn’t work for me. I had to go cold turkey and just see what worked. I immediately felt really amazing in my body, and the biggest benefit is my energy. I am no longer foggy in the morning. I have much clearer attention, and I think it’s because I am sleeping magnificently. And so this was maybe one of those things that I didn’t even realize was having that effect. I sensed that it was the bold move I should try, and again, this is a trial and error process and kind of going at it, try a little bit here, see if it works, see what you’re willing to do, see what effects your body has. The payoff, ladies and gentlemen, has been so great for me that I will not change this, I don’t think, ever, even on a big vacation. Now, I drink bourbon. I went out to a French restaurant, I know they have good wine, with a girlfriend. We’re in a celebratory mood and this was going to be my exception, my night that I chose to have wine. Now, what was so great about it is I remembered another guideline that worked for me; I never drink wine on an empty stomach. So we very quickly ordered appetizers and ate crudités and a little bit of a cheese platter; my favorite way to dine in a French restaurant, very slow and leisurely. And then the wine came, and then we even ordered half-entrees together. We split a meal and we were going to go to a rooftop restaurant and get a cocktail but we decided to go back to my house and we had bourbon on the rocks. And I had as little – it wasn’t even a shot, and sipped that lightly that night and I had no hangover the next day. I loved what I enjoyed. I just enjoyed what I chose. And even the next night, we chose to have cocktails, and I realized I just didn’t want one. So I sipped it a little bit and just put it aside, but no drama. Now, I’m telling you there was drama practicing this, a ton of drama. When you make a bold moves that especially you gut-check, know in the soul of your being, that it is something you should watch and take care of, something that might be bothering you, like you have a hunch, like you love bread and you’re eating a lot of it, it might be something to look at or something that you’re overdoing or having a little loss of control over or have a habit where you just sense, if you made a shift here – and I’m talking about a shift in doing what really empowers you, not being restricted. But our brain will go, oh my god, you can’t have wine, what are you going to do? What are you going to do at the party? What are you going to do there? And so I had my week of drama, and then I had my weeks of kind of trying it, and then I would go back to my old habit and I didn’t like how I felt and I reengaged in the no wine except one night. And I’ll tell you, I’ve been subtly working with this since the podcast, and my recollection is that it was late fall, and I’m now totally no drama. I love how I feel and I think a lot of it is just not feeling the drama in my brain anymore, because when we allow discomfort and then keep practicing the bold move we want to make – I’ll keep using my example so you understand. But every time something would come up, I’d just remind myself how great I felt after that first week of doing it for seven days. And it was uncomfortable that seven days, so it’s the hardest at the beginning. And then my brain, every time I have wine on like a Saturday night, your brain will always ask you, like, are you sure? And I find that interesting, and now I’m like, yeah I’m sure. Before, I wasn’t so sure, tried to go back to my habit for a week, and then I was really sure again. So allow yourself to fail at it and go back and try, fail at it and go back and try. So again, I’m giving you the inside track of what I teach my clients. I want this to have an impact in your life. By choosing one facet of one tool that I teach, fuel testing or hunger scale, choose one very achievable movement goal and put it in your calendar and allow – again, if movement is now to you, you’re going to have to allow the drama of, like should I work out or should I work, should I do this? And you’re just going to have to allow the drama and honor that calendar. And again, like the bold move with the wine, you will find your brain has a lot less drama. I do not have any drama about working out now. I cannot wait. I’m mad when I can’t get to it. I’ve shifted, but this is a journey. I’ve invested the mindset work, self-coaching, being coached by others, and I’ve invested the time. So one tool, one movement goal, and a bold move. You know, your bold move might be the thought work on it for a couple of weeks. I thought about it a long time before I admitted it in a podcast. It was almost like the gauntlet when I decided to do the podcast on it. And I was like, oh no, I’m going to have to confess. And what is that like, confessing to your entire podcast audience, right? So this was amazing. I loved what happened here because the payoffs were not – actually, I will tell you, I was looking for weight loss results because I had five pounds that would not come off. And I’ve lost about three and a half pounds since I made this change. I’ve made one other; I am no sugar no flour in most things. Not in a 100% way, but I do not eat deserts. I don’t have any drama even in the most delicious buffets anymore, which is just fascinating to me. I giggle now. But you don’t have to do that. You can have once a week that you have a dessert. It’s not a big deal. But the payoffs are so great, but you will have to do your work. You will have to send me a question and say, Diana, why is this so hard? And I’ll give you some ideas and a way to interrupt that. But that’s where I’m coaching my clients. If you’ve ever been curious about what happens in coaching weight loss, this is what happens. It’s like, why is this so hard or why did I overeat when I was with my parents all weekend? And we get to the mind part of it, the thought that created the energy of wanting to either buffer or to feel better with food, and then dialing back and using these tools, which I’m sharing with you today, of focusing on a food tool, focusing on a movement goal, minimum, easy to attain, and taking a bold move. Alright, you’ve heard enough there, but if you have any other questions, the outline of this will be in the show notes, and that’s dianamurphycoaching.com/CEO28. 28 since I changed the name to Weight Loss for CEOs. Alright, now there’s one more facet that I think can change your life, and not just this work. It is evaluating your results in a much more life-giving way, in a much more positive way. So, if you’re doing these three tools and you’ve chosen your one tool, you’re doing the movement goal and the bold move, if you really want to dig in, the next part is evaluating your results. And this is weighing yourself, if this is weight loss. And this can be around any goal. So I’ll do a parallel of two goals. So if your goal is weight loss, I would want to know what your weight was and asking these three questions; what worked this week? And your mind, if you gained weight or stayed the same and felt like you should have lost weight will go to a very ugly place, very ugly. And that’s when you keep asking the question, let your brain answer, what worked this week though? What did work? Especially if you’re doing these tools new, you want to be always asking that question first, what worked, and give yourself some time to answer because very quickly your brain is going to go to critical mode and go to my next question. So, the first step is, what worked, and then what didn’t work? Be honest about what didn’t work. And this is where we get to the bottom of what isn’t working for us. Like, I do typically overeat if I drink very early in a meal. I will order incorrectly or I don’t like the feeling of being drunk, and so I start eating to temper it. So I usually overeat when I drink. Isn’t that fascinating? I didn’t learn that without really evaluating what didn’t work. That one night I went out, they served wine right away. We didn’t order, our food it took two hours to come and I just gulped down my meal. And it was because, for me, and everybody’s a little bit different, I was uncomfortable having that much alcohol in my system. And that’s why I really decided to drop wine, by the way, because I’m like, wow I’m overeating to help my wine symptoms. So I decided to dial down the wine. And it’s totally up to you. My clients do all sorts of things. In this ebb and flow, there is no hard and fast rule. Do you. So, what didn’t work? What were some things that got you off track and really be honest about them so that you can get some insight. And then the last question is what are you going to do next time? What are you going to do next time, my friend? And again, focus on the tool, the movement, and a bold move. And so what are you going to do next time? What would work? So if the weigh in didn’t work well, what is something that you want to focus on next time? It’s like, wow, I noticed I overate quite a bit, so I’m going to focus on plus-two. And others, it’s I waited too long, and so I was so hungry I ate too much after that because I waited too long, then that would be what you’d do next time. So this really relates, the simplified tools, plus really evaluating well really boils it down for you so you can quickly evaluate your week and get onto the next week. Now, this includes weighing in. And so, what worked, what didn’t, and what are you going to do next week? And sometimes, what I ask people if they’ve gained weight is – and it’s a very non-judgmental question, but I will ask, does it make sense that you gained weight? And if they really dig into the intuitive eating tools that they’ve done that week, they’ll say, yeah I think I just chose this too often or I ate to plus-three almost every meal. I’m just going to dial it back a little bit. And for that client, I might even ask them, well your tool might just be eating to two and a half, and then the next week to plus-two. So see how you can tweak, and think about any goal you have in your life. What would it look like if you were more positive about it by asking what worked, now what didn’t, get kind of creative, insightful, and what are you going to do next time? Does it make sense that you got those results? And we can have some surprises. There’s weeks that weight drops off and we don’t know why, and there’s weeks that we gain a lot of weight and we don’t know why. And getting curious is our power tool on being able to understand what we can do next time. You know, it might be that you get really blown up by alcohol or you got really blown up by a certain food. Does it make sense? It’s like, yeah that could be just water weight, let’s see what happens next time. So that’s evaluating around weight loss and the only suggestion would be, if you’re working on movement, would be how many times did I work out? That’s your weigh in, how many times did I workout? What worked? What didn’t? And what will you do next week? And that might be that I always chose work and worked too late and so you didn’t work out as many times. But what worked was that I had it in my calendar and I worked out two of those three times, but what didn’t work were the other three nights I wanted to do at least one out of those three times and I didn’t. And you’re realizing that you’re thinking these thoughts, like I need to work, and you’re not honoring that commitment. So next week, you might look very carefully to make sure you plan it right and start closing down your desk at 4pm so that you can make sure that by 5:30 you can bolt out the door and honor that workout, or you can create a to-do list for after work and make sure you make your workout. You know, if it didn’t work because you always stayed at work then you’ve got to create a solution for that obstacle. Now, I know all of you are great, great solution masters. You are great problem-solvers or you would not be CEOs. But when it comes to taking care of your body, we get in our own way and we’re very judgmental about what our behavior was the week before, and this little template for you, which is really literally what I’ve created is a template of how to – my goal today was create this for my clients and you, because if we have a template and look through a positive lens and dial down and tweak the tools that we’re using in any area of our lives, but especially around wellness, which is my strength, that’s my transformation, that’s what I can teach so deeply, we can accomplish anything. Now, I hope you have enjoyed this. This is one of the podcast episodes that you take the time to go to dianamurphycoaching.com/ceo28 and get the download. Get the template so that you can literally start practicing this. You know, I intentionally don’t work with a lot of people, a high number of people, and that allows me the freedom to network, it allows me the freedom to create my podcast, but it also gives me time to be in touch with people that are listening to my podcast. And I encourage you, ask me questions. I will not answer like, oh we should get on the phone or I will offer that to you if you sound like you’re ready and want to work with me; that’s up to you. You can schedule a consult with me from my website. What I’m really talking about here is engaging in this process and getting the results that you desire, and I just invite you to do that. So, I expect this to be my highest download worksheet. I’m making a challenge to you. But what I really hope is that you listen to this carefully, and carefully one more time. And maybe even use it on repeat a few Fridays after you’ve done this work for a week and you create the amazing results in your life that you most want. This is what I’ve done and this is what my clients are doing. And next week, what you’re going to hear from me is the absolute amazing outcomes that happen when you really dig in and do the mindset work to create the result of weight loss. There’s so much more to it. There’s so many side benefits that I will always speak very highly of doing weight loss this way. And I have some really fun stories to share with you next week. I hope you’ve enjoyed this and I’m just going to review one more time in case you kind of tuned out on some of my explanations and you’d just like a summary. This is just for your benefit at the end and it is, one food tool to focus on and actually even one facet of that tool, one minimum movement goal, put it in your calendar, and one bold move. And then, weigh in, or evaluate how much activity you took in those areas that you’re working on. It could be meditation. It could be thought work. It could be managing your stress, anything, weight loss, any measurement that you have on that. Then, what worked, what didn’t work, and what are you going to do next time? This is a way to get out of the judgment zone and get into creating results zone. I can’t wait to hear from you and have a fabulous day. Thanks so much for being a listener. You know, I really, really appreciate you being here. I do these for you. Have a great day.